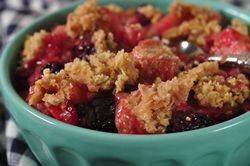 A nice way to end a meal is with this warm and tasty Blackberry Rhubarb Crisp. There are two parts to a Fruit Crisp, the fruit filling and the streusel topping. For this recipe, the filling has chunks of rhubarb and juicy blackberries that are coated in a sweet mixture of brown sugar and orange juice. The oat based streusel is crisp and crunchy and I love to serve this old fashioned dessert in pretty bowls, with a scoop of vanilla ice cream slowly melting on top. While fruit crisps can be made with a variety of fruits, for this Blackberry Rhubarb Crisp I have combined rhubarb with blackberries. I know that rhubarb is usually paired with strawberries or raspberries, and you could use them here in place of the blackberries, but when I saw this fruit combination in Wayne Harley Brachman's "American Desserts", I just couldn't resist trying it. And I wasn't disappointed. These two fruits go beautifully together especially when mixed with just enough brown sugar to offset their tart flavor and a little orange juice, because the rhubarb and blackberries do not release a lot of juices during baking. The streusel-like topping that is spread over the fruit is a mixture of flour, brown sugar, ground cinnamon, butter, and rolled oats. As it bakes the streusel becomes golden brown, crisp, and crunchy which makes a nice contrast to the soft fruit. Crisps can be baked in one large pie pan or in individual serving dishes. For this recipe I have baked the crisp in one large pan. Oh, how I love the muddle of tender rhubarb and juicy sweet blackberries all covered with streusel. This dessert is at its best when served warm with a scoop of vanilla ice cream or softly whipped cream. Blackberry Rhubarb Crisp: Preheat oven to 375 degrees F (190 degrees C) and place rack in the center of the oven. Butter, or spray with a non stick cooking spray, a 9 inch (23 cm) deep dish pie plate or an 8 x 8 x 2 inch (20 x 20 x 5 cm) baking dish. Filling: Place the rhubarb and blackberries in a large bowl and toss with the brown sugar. In a separate bowl, whisk together the orange (or apple) juice, cornstarch (corn flour) and vanilla. Add this mixture to the rhubarb mixture and toss to coat. Transfer the fruit to your baking dish and sprinkle the streusel topping evenly over the fruit. Bake for approximately 30 - 35 minutes or until the topping is golden brown and the juices from the fruit are just beginning to bubble. Remove from oven and place on a wire rack to cool for about 30 minutes before serving. Makes 4 - 5 servings.